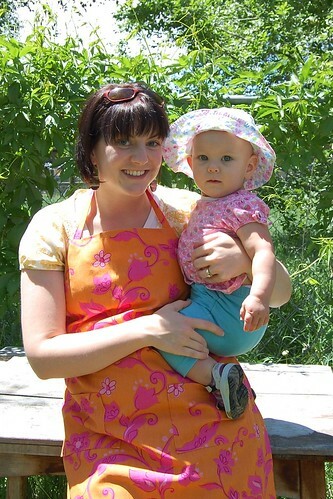 This is a ridiculously easy pattern for a simple butcher style apron. This is the second time I've made it and it went sooooo fast! I was able to speed things up a lot by making the tie that goes around the neck out of mock-bias tape that I cut out of leftover fabric instead of turning a huge tube of fabric like the pattern told me to do. (Aunt Kathy would be so proud.) I really like making this pattern with home decor fabric because it feels like it adds a little more protection against messes while cooking. I also like adding a little flair along the bottom to give the apron personality. I'm always shocked at how a tiny bit of work can add so much. 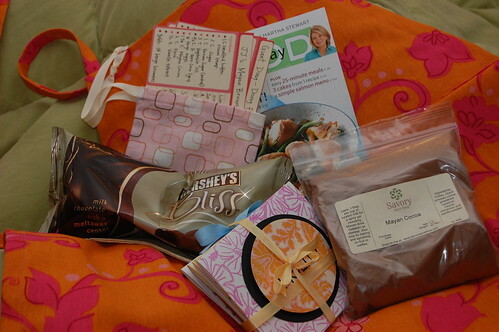 I also included some of my favorite recipes in a cloth bag along with a magazine, homemade cards, chocolate, and Mayan cocoa. I hope she enjoyed her package! I would recommend taking part in a blog swap whenever you get a chance. I personally feel that a girl can never have too many aprons, so I'm looking forward to making this apron again along with a couple of others I have swimming around in my mind. Can you tell it is sewing season for me? Maybe an apron giveaway will be in the works...we shall see! Until then...here's a picture of me and my baby cakes because it's my blog. That's a cool swap, I always miss out on the good ones. I think an apron is next on my list of things to make. Great colours! I love it. And the little bag with the recipe cards. You can never have too many cute aprons! I'm going to be making them with my Laurels next month. How true, one can NEVER have too many aprons! My sister-in-law made me a really cute one that you would like. She sent me the pattern, too. Hmmm, maybe that means you would have to come over to my house. . . . 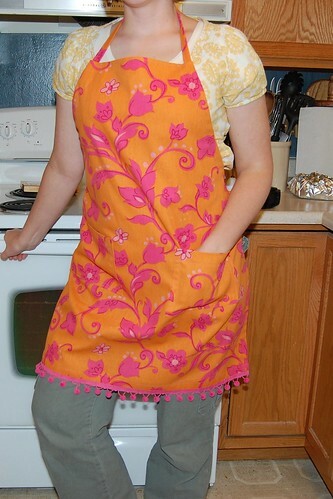 Cute hair and cute apron! That fabric is the fabric my mom used to make my giant ribbon memo board! Love it! You look adorable! WOW, I REMEBER YOU AS A SOFT BROWN HAIRED CHIC, BUT NOPE I LOOKED CLOSER AND HOLY COW THAT IS YOU IN THAT PIC WITH BLACK HAIR. LOOKS GOOD CHICA! NOT TO MENTION THAT CUTE LITTLE PROP YOUR HOLDING.